The British Army in 1914: The Old Contemptibles. They were a small, well trained, elite force, and were provided with the finest load-bearing infantry equipment in the world at that time - Pattern 1908 Web Infantry Equipment. On the same day that war broke out, 5th August 1914, the newly appointed Secretary of State for War laid the case before Parliament for an additional half million men. The popular view, that the war would be over by Christmas, had not even been voiced, but Kitchener felt the duration would be nearer three years. 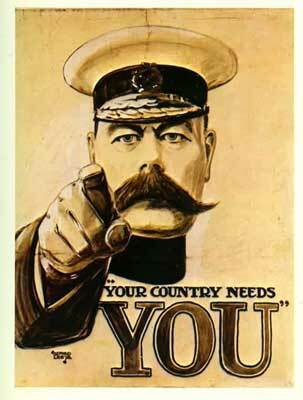 On 11 August, Alfred Leete’s famous poster announced "Your Country Needs You", the requirement being for 100,000 men. The First Kitchener New Army, or K1, as they became known, was fully subscribed within just two weeks. On 28th August, a call went out for a second 100,000 men to form the Second New Army, or K2, with K3-5 being required shortly after. Self-evidently, the Mills Equipment Company and M. Wright & Sons, already fully engaged in manufacturing for the Regular Army, lacked the immediate capacity to manufacture sufficient Pattern 1908 Web Equipment for this sudden and massive expansion. Mills put in train the construction of Factories Nos. 2 and 3 and 9 months from completion, had achieved 20,000 sets of W.E. per week. 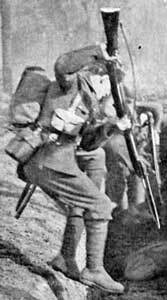 In the meantime, the solution was the Infantry Equipment, Pattern 1914. The pre-war changeover, from leather Pattern 1903 to web Pattern 1908, had left many former military leather goods suppliers out of work. Some went out of business, some changed and prospered, and some just hung on but, for the most part, that capability was still there and very much under-used. Pattern 1914 put that resource to use, through a requirement to produce a version of Pattern 1908 in leather. It wasn't an exact copy - the Australian Leather Infantry Equipment (aka Pattern 1915) is much closer to Patt. ‘08 - but it was close enough. The new leather pattern was approved on 30th August, 1914, followed by approval of a detailed Specification on 11th September, 1914. The New Armies had to be trained, so Pattern 1914 would be used during this phase. The picture on the right shows one of "Kitchener's Mob" wearing Patt. '14 in training at Aldershot. The photo at left below, from a postcard in the Karkee Web Collection, is of a private in the Middlesex Regiment, wearing I.E. Patt. '14 in Marching Order. The two webbing manufacturers could not possibly have caught up sufficiently for re-equipment of the New Army Battalions by the time the first went overseas in 1915. As a consequence, Pattern 1914 was carried by front-line troops, both on the Western Front and in the Middle East. It is hard to credit that this was unforeseen when Pattern ’14 was approved. No official source gives any indication that it was “Training Only”.1 In addition, the ammunition capacity of 120 rounds, in the pouches, would seem to be excessively large, simply for training - other than “weight training” perhaps! Lethern does state that troops proceeding overseas were to be issued with Patt. ’08 W.E., but this plainly did not happen with some units. It is a matter of faith with collectors today that Pattern 1914 gear was made with second-grade leather, and that is one reason so little of it survives today. Nothing is further from the truth. The Specification stated “…soft pliable split cow hide leather…the waistbelt and back of pouches…made from prime, firm, well-dressed (leather)…free from flaws, warble holes, or other defects…” The metal fittings were to be “…best hard drawn brass wire…”, for the 2-inch buckles and belt catches and the remaining parts “…may be cast…”. This is clearly not an ersatz equipment. In the M.E. Co. history, Lethern stated that 1,000,000 sets of Patt. ’14 were manufactured, both in the U.K. and U.S.A. – twice the amount necessary for Kitchener’s half million men. The real reason for its scarcity today is that it was withdrawn from all Regular units, by authority of Army Council Instruction No. 9, dated 5th January, 1921. The withdrawn equipment, together with all stocks “…will be considered as surplus and dealt with in R.A.O.C. depots accordingly.. The inference is that it would then be disposed of, some of it possibly even “…reduced to produce…”, which was a common practice. The Bayonet frogs won a reprieve, by A.C.I. 349, issued 31 May, 1921, being issued in lieu of buff leather Frogs, which would instead be withdrawn and returned to store. We've all read tales of how, upon arrival on the line, reinforcements were told to toss their leather equipment and were given battle recovered Pattern 1908, complete with bloodstains from its former owners. There is no doubt that, under the right circumstances, that kind of incident did take place. For example, the following is taken from Twelve Days On The Somme, A memoir of the Trenches, 1916 by Sidney Rogerson, originally published in 1933. One of my NCO's hurried back to me with the news that he had found behind one of the marquees a big dump of equipment taken from wounded or dead men. A lot of this equipment was of the khaki webbing type which was the active service harness of the regular army. When the Regiment had landed in France in November 1914, every man had naturally been equipped with webbing, but of recent months the new reinforcement drafts had arrived with the unsightly leather belts and cartridge pouches such as were issued to Kitchener's Army, until there were almost as many men with leather as with webbing. Efforts were constantly being made to discard the leather, for not only was it clumsy, unsightly, and difficult to fit, especially when wet, but it was held to be the badge of the new arrival or temporary soldier. Any tendency on the part of the war-enlisted man to run down the "old soldier" must be regarded as a manifestation of an inferiority complex, for imitation is the sincerest form of flattery, and the desire of everyone to possess a suit of web equipment must be put down largely to the desire to resemble as nearly as possible the "real soldier." Here then was a chance, my NCO whispered, to fit out the whole of B Company with the coveted webbing. Might he have my permission? It was no sooner asked than given, but the news seemed to pass quickly around the Battalion, so that, although we had a good start, there was in a few minutes something in the nature of a stampede towards the casualty clearing station. There you have the interesting spectacle under the conditions that prevailed of men jostling and struggling good-naturedly to seize sets of saturated equipment with as much zest and energy as if they had been competing for dips in the bran tub at a parish bazaar. The discovery of that dump was a godsend, for not only did it enable us to reduce the percentage of leather equipment, but it kept the troops enthusiastically employed. Of course, this has to be put into historical context. Rogerson served with the 2nd Battalion, West Yorkshire Regiment. 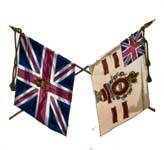 The West Yorkshire Regiment (Prince of Wales's Own) was originally raised in 1685 and took precedence in 1694 as the 14th Regiment of Foot (see the colours of the 14th Foot at right). The men of 2nd battalion, Old Sweats and replacements alike, wanted to distinguish themselves from the New Army. Along with the simplified Service Dress jacket, Pattern 1914 Infantry Equipment was the mark of a Kitchener man, and many soldiers in Regular battalions tried to get rid of these items as soon as was possible or practical. This would not have happened in Battalions solely equipped with Pattern '14. Looking at photos from as late as 1918, it is obvious that Pattern 1914 remained very much in combat use, right up until the end of hostilities. I've enclosed a pic. 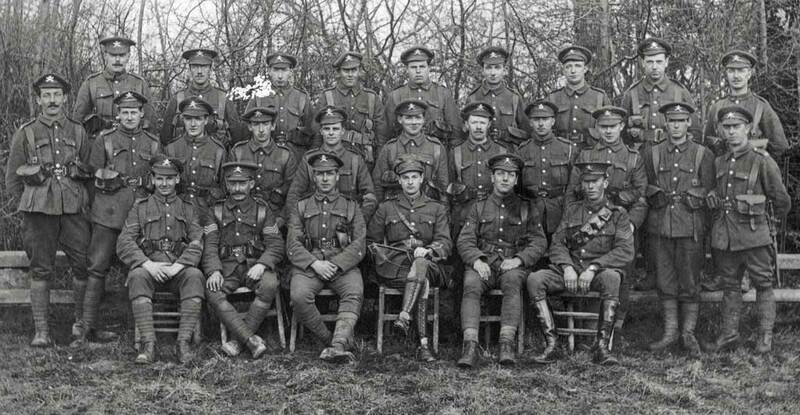 This was taken 1915 - 16?, on leave in Bury St Edmunds, not 12 miles from where I live now. He's also wearing the simplified tunic. I bet, as a regular that quickly got replaced. Three years 'undetected crimes', but only one wound stripe here - two more followed. This first one earned in front of Neuve Chapelle, 19.12.14, courtesy of shrapnel incurred in a raid on the British lines by German bombers. Him & 123 other casualties. I still have the P.O.W. collars & cap badge shown, a 'good luck' sweetheart he carried through the war, King Albert's book presented to him in hospital on 1.1.15, his medals & service bible, & a couple of pre war army pics. That little collection, & his stories are certainly a big part of where my interest has sprung from. Reading that on KW feels like it's come full circle! In addition to its use by British forces, I.E. Patt. '14 saw limited Canadian service. The late Jack Summers, in his Tangled Web: Canadian Infantry Accoutrements 1855-1985 (Museum Restoration Service, Bloomfield, Ontario, 1985), states that Patt. '14 equipment was used by the Canadian Machine Gun Corps. "Gun-numbers wore pistol and ammunition pouches", he says on page 83, "while others, except drivers who wore cavalry bandolier equipment, wore the standard British '14 Leather infantry pouch and carried rifles." For this information, Brig. Summers references Canadian Machine Gun Corps: Organization, Administration and Duties, London, 1919. KWRT's own Steve Hewitt has recently found more detail in a document he's located: War Office Contracts Placed or Being Executed in Canada 1914-1917. This document (Catalogue Reference CAB/24/14), dated 10 May, 1917, is under crown copyright and unfortunately can't be reproduced here. However, it states that during the period 4 August to 31 December 1914, Canada purchased 103,000 sets of Infantry Equipment Pattern 1914, for a total cost of £206, 127. Pattern 1914, in the form of its Ammunition pouches, had a further lease of life. In Jan 1927, the Pouch, tool, linemen, empty was authorised, which was effectively a second-pattern Patt. ’14 Ammunition pouch. It is not known whether first issues were Patt. ’14, from the stocks withdrawn for disposal in 1921. However, new production has been noted, examples being dated 1941 and 1944. A word of caution, these are easily recognised, as the central strap is reversed, with its flesh side facing outwards. At least one noted expert has wrongly used one of these pouches in a reconstruction, captioned as “Pattern 1914”. Another curtain-call was taken by Pattern 1914 Infantry Equipment – in 1939. Sir Alexander Korda’s superb film of A.E.W. Mason’s book, The Four Feathers, had the “Egyptian Army” equipped with Pattern 1914, the pouches all of the two-tab type. Sadly, Pattern 1914 could not serve the needs of another war, even if sufficient stocks remained. Thus Pattern 1939 Equipment was designed, on an incredibly short timescale – over a weekend, with War Office approval gained the next day. This replicated, almost exactly, its Pattern 1937 W.E. partner. And finally, we present a splendid photograph, provided by Paul Hannon, of a Machine Gun Section on the Arras Front in 1916. Most of the troops are wearing I.E. Patt. '14 (However, note very young officer in Sam Browne Equipment, and the driver with a Patt. 1903 Bandolier), but a few sport W.E. Patt. '08. This reminds us of the short note at the end of Chapter V., Section 6. of the Provisional Mobilization Stores Table / Machine Gun Battalion, dated May, 1918 (see the Official Documentation page for a copy). The Stores Table prescribes I.E.Pattern 1914 for use by Machine Gun Battalions, but the note reads "*If any 1908 pattern web equipment is in possession it will be retained" . Scrounging was a way of life in the Army then, just as it is now. 1. Paul Hannon has reported seeing a number of items that were marked "For Training Purposes Only". Whilst this does not necessarily indicate official thinking across the board, it is interesting. Have you got any Patt. '14 equipment thus marked? We'd love to see pictures.